This review first appeared in the October 17, 1984 issue of The Daily Aztec. Once in the forefront of the progressive rock scene of the 1970s, Jethro Tull has now become a bit of a cult band, followed mostly by its diehard fans. Those same fans will be glad to know that founder/singer/flutist Ian Anderson and guitarist Martin Barre, with newcomers bassist David Pegg and drummer Peter Vettese, is soldiering on, with another very solid album to the band's credit. 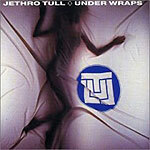 "Under Wraps" is a theme album and, like their masterpiece, "War Child," deals with the absurdity of the East-West tensions of the Cold War. Anderson's acerbic pen has given us yet another glimpse of the world through the eyes of this brilliant cynic. "Lap of Luxury" is a highly melodic tune about the struggle to achieve financial security in a democratic, capitalist society. Andersons' vocals here are vintage, but the band's overall sound has been altered by the increase prominence of synthesizers. However, "European Legacy" returns to the sound of Jethro Tull of years past. Anderson delivers the lyrics in a metered cadence, subtly accompanied on acoustic guitar. And his extended flute solo is in his patented style. "Later, That Same Evening," "Saboteur" and "Radio Free Moscow" continue the discussion of the Cold War, and the level of musical excellence. There are a few dull spots here, notably "Heat" and the title track (and its reprise). But the album closes out strongly with "Paparazzi" and "Apogee." While there aren't any classic Tull tunes on a par with "Aqualung" or "Skating Away on the Thin Ice of a New Day," it's still a very good album and rewarding to hear Anderson performing in peak form.